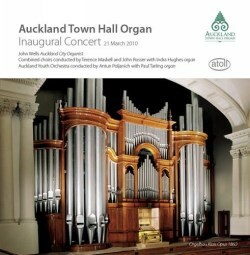 This CD presents the inaugural 2010 concert featuring the new organ in Auckland Town Hall. The introduction to the liner-notes, by the trustees, states that this ‘is a bold new organ in a historically significant and acoustically world-class concert hall at the very heart of New Zealand’s largest and leading city.’ The trustees continue by suggesting that this new organ will fulfil its role for the next century, and hope that it will not need rebuilding or restoring in that time. John Wells gives a detailed history of the ups and downs of the various organs in the hall over the years. He bemoans the less-than-successful ‘baroque-isation’ of the instrument in the 1970s. The present brand new organ, built by Klais of Bonn, has recognised the need for a wide-ranging instrument to fulfil a number of roles, including civic celebrations, recitals, graduations, recordings and broadcasts rather than just providing a niche instrument for baroque music. It also includes two original Maori ‘instrumental’ stops. These 2010 celebrations get off to a rousing start with Charles Hubert Hastings Parry’s well-loved anthem ‘I was glad’. Originally composed for Edward VII’s coronation in 1902, this has been performed at every Coronation since. It is also widely used ‘in choirs and places where they sing’ and at other ceremonial events with the ‘Vivat Rex’ or ‘Vivat Regina’ section omitted. This is followed by Johannes Brahms' ‘Laß Dich Nur Nichts Nicht Dauren Mit Trauren’, Op. 30 which was inspired by the composer’s study of the Renaissance masters. Brahms brings to this music a detailed understanding of contrapuntal technique and a distinct romantic sensibility which results in a truly beautiful piece of music. I have never heard any music by John Wells. The brief biography in the liner-notes explain that he is a recitalist, broadcaster, recording artist, teacher, examiner and composer. English-born Wells — he was a former organ scholar at King’s College, Cambridge — has regularly performed throughout New Zealand since 1970 as well as presenting many recitals overseas. In 1998 he initiated the Town Hall organ rebuild project. The Organ Symphony is interesting. I expected something that was possibly dissonant or post-modern. What Wells has delivered is a work that owes more to the great French organ school of Widor, Vierne and Dupré rather than Messiaen or the minimalists. The Symphony is composed in five movements. It opens with a powerful allegro which showcases the heavy reeds and reveals the sheer power of the instrument. The second movement makes use of a stop specifically inspired by the traditional Maori flute-like Koauau. It starts peacefully before exploding into a lively, cinema-organ style march featuring the Great Tromba and the Solo Orchestral Trumpet. The quiet opening of the movement is then reprised. The spirit of Vierne is invoked in the powerful Toccata which follows. This is virtuosic writing that features rapid passage work on the manuals and complex pedal work. The fourth movement introduces the other ‘local’ stop the ‘Pukaea’, which is a wooden trumpet. This is reflective music that makes use of the organ’s string and celeste stops. The finale is an exuberant fanfare showcasing the reeds and the 32-foot pedal stops. John Wells’ Organ Symphony in C major is an enjoyable work, which may suffer from being a touch over-derivative of a popular French historical style. However, nothing can take away from the effectiveness of this work in displaying the palette of stop-colour available to the organist. The next work is by Edward Bairstow, organist at York Minster (1913-1946). ‘Blessed City, Heavenly Salem’ was composed for a group of West Riding churches: it is based on the plainsong melody traditionally associated with the Latin hymn ‘Urbs beata Hierusalem’. With a near-perfect fusion of voices and organ passages it is hardly surprising that this is the composer’s masterpiece. It is given an ideal performance by the assembled choirs and the organist. The final work is one of my favourite pieces of organ music. Guilmant’s Symphony No. 1 in D minor was originally his Organ Sonata No.1 which was published in 1874. It was later arranged and orchestrated by the composer. The liner-notes are correct in assuming that it is a ‘concerto in all but name’. There are three movements: a powerful introduction and allegro, a reflective Pastorale and an inspiring finale. Paul Tarling plays this Symphony magnificently and reveals the huge potential of this large romantic organ. The liner-notes leave a little to be desired. It would have been useful if the texts for the Parry, Brahms and Bairstow had been provided, A little more historical detail about the music would also have been helpful, including the dates of every work. There is the usual essential organ specification and brief biographical notes about the players. It is good to have another version of Guilmant’s Symphony No.1 especially on this excellent instrument — there are already four others in the CD catalogues — as well as the new work by John Wells. The choral pieces are all given exemplary performances. All in all this is an interesting and satisfying release.